Macromedia UltraDev is a RAD for web applications running on ASP, ColdFusion or JSP application servers. We have been running the PostgreSQL database system since 1997. Our objective is to use this RAD environment to develop simple web applications using the Tomcat JSP application server with Apache and PostgreSQL database software running on Linux powered servers. Binary versions of all software were preferred in this example. Our objective is to make the process as simple as possible for non programmers. However basic knowledge of Linux file system layout is required. Most of the following is in the docs. Our goal is to get the essential information together in one place - please use this as a "cheat-sheet". This document does not replace a good long read of the docs, especially the PostgreSQL user manuals and the UltraDev "Using UltraDev" book. They are very good, read them now before going any further. A Linux database server and a web application server. This should be two separate machines in a production environment - one for the database system and another for the web application server. In our development environment both servers run on the same machine. Our examples are based on the RedHat 7.0 distribution. If you are already running another distribution you will have the knowledge required to modify the path to suit your set up. Copy the mod_jk.so to the directory containing the other modules. The JDBC driver, PostgreSQL.jar, should be copied to /usr/local/tomcat/lib. Thanks to Justin for the heads-up on this one. Finding the bits and pieces, downloading and putting them all together took about half a day, so plan ahead. My Apache modules are in the modules directory under the Apache tree. Restart Apache and check to see if your module loads correctly. Install your application root folder in /usr/local/tomcat/webapps/yourappname. TIP -do not call your test app "test"! There is already an app called test in the webapps folder. Set /usr/local/tomcat/webapps/yourappname as the ftp root for your tomcat user account. Last of all /usr/local/tomcat/conf/workers.properties must be modified for your Linux set up. The last line is not necessary if you reboot your machine. We modified /etc/profile earlier on remember. Start Tomcat then restart Apache. Now all requests to http://localhost/examples/ should be sent to Tomcat. Test that everything works before going any further! 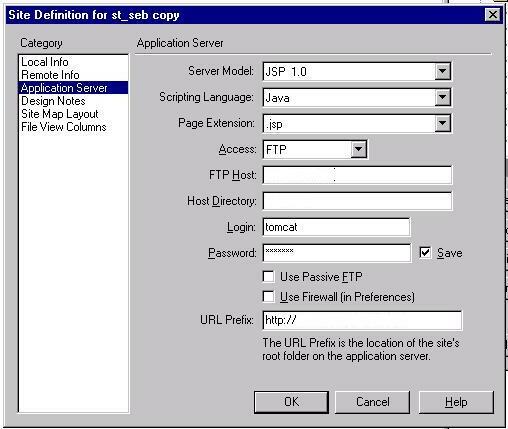 Configure PostgreSQL to accept Tcp/IP connections and to allow the database owner to connect from the application server machine. Start PostgreSQL as per instruction in the PostgreSQL documentation. Create your database and try connecting to it. This has been tested from the Windows version of UltraDev 4.0. It works with the Mac version too. A good idea is to do the UltraDev tutorial from start to finish. Once done you have all the basic knowledge you need to move on to your own custom applications. To install; right click on the above link and save to your Configuration folder. Now after opening a page in the web application you are building we shall define a connection. Name it connYourappname to make it easy to identify. The User Name and Password are the ones you use to connect to the database and are probably different from the FTP user defined above. (This stumped me first time around). UltraDev will use the JDBC .jar file in the tomcat/lib directory. Another thing I did wrong was to have a copy of the PostgreSQL.jar file in my JDK tree. It did not work for me. Using UltraDev to build JSP based web applications is about as simple as it gets. The apps run on any java capable browser. The RAD requires no prior knowledge of the Java language. It does require some knowledge of SQL - but the SQL primer in the PostgreSQL docs covers this quite well. If you wish to go further, Java knowledge is a must. All questions concerning this HOWTO should be addressed to the postgres-general mailing list.